Do goalkeepers behave rationally when attempting to save penalty kicks? This is the question Ofer H. Azar and Michael Bar-Eli set out to answer in their study Biased Decisions of Professional Football Players: Do Goalkeepers Dive Too Often For Penalty Kicks? 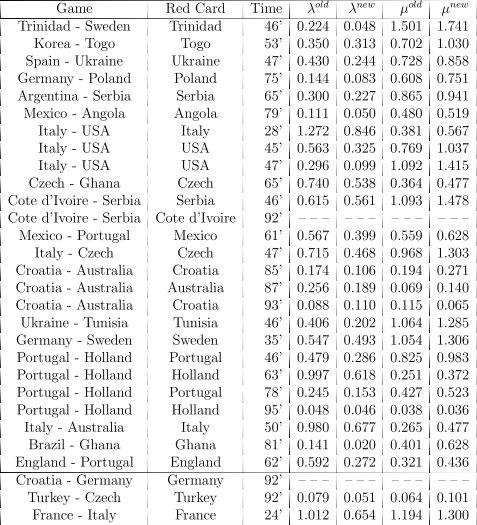 They analysed a sample of 286 penalty kicks from different European leagues and international competitions, the results of which are summarised in Table 1. Note that all directions are listed from the goalkeeper’s perspective and that only kicks which were on target were included in the sample. One interesting thing to note is that goalkeepers chose the correct direction in 43% of cases compared to 33.3% were they guessing randomly, suggesting that choosing the correct direction is a skill and not just a guessing game. Table 2 below lists the chances of stopping a kick for different kick and dive direction combinations as well as the total probability of stopping a kick for different dive directions denoted by P(Stop). As we can see the chances of saving a kick when the goalkeeper stays in the center is 17.2%, almost 50% higher than diving to either side. This is largely due to the fact that when the kick is to the center and the goalkeeper stays in the center he saves it 60.0% of the time, compared to 25.4% when the kick is to the right and he dives to the right and 29.6% when the kick is to the left and he dives to the left. It must be noted that the sample size of staying in the center is very small and thus sensitive to changes in inputs. In the sample goalkeepers saved 6/10 shots to the center when they stayed in the center. However, if we change one save into a goal and lower that figure to 5/10 then the overall probability of saving a shot when the goalkeeper stays in the center drops to 14.4%. A larger sample size is needed before we can be fully confident in the figures. To return to our original question: do goalkeepers behave rationally when attempting to save penalties? The answer is no. As we can see in Table 1 goalkeepers stay in the center in only 6.3% of cases. The data suggests the center is where they have the best chance of saving a penalty yet roughly 19 times out of 20 goalkeepers will voluntarily choose a suboptimal option. Even if we assumed that because of the small sample size the data was skewed, and that the probability of saving a kick in the center is actually no higher than saving a kick to either side (which intuitively doesn’t make a lot of sense but let’s assume it does) goalkeepers should still stay in the center far more often then they do and have their distribution of dive directions be something like 33.3%/33.3%/33.3% instead of 49.3%/6.3%/44.4% which it was in the sample. According to norm theory, people have stronger feelings associated with outcomes when they come from abnormal causes. 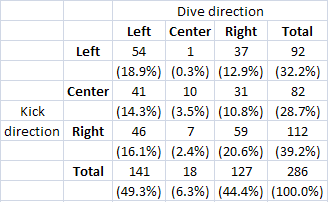 Consequently, because the norm is that goalkeepers dive to one of the sides, the disutility associated with missing a ball might be greater following a non-common behaviour (staying in the center) than following normal behaviour (diving to the side). As another possible answer the authors present data suggesting that goalkeepers derive more pleasure from saving a difficult shot or saving a shot after diving. Since goalkeepers aren’t really expected to save penalties anyway they would rather try to be a hero and pull off a great save than take the option which actually saves more penalties but almost all of those saves are boring and routine. Whatever the reason it is clear goalkeepers do not behave rationally when attempting to save penalty kicks. They dive far too often and would be better served by staying in the center more. Both studies cited in this article can be found in the book Myths and Facts About Football: The Economics and Psychology of The World’s Greatest Sport, edited by Patric Andersson, Peter Ayton and Carsten Schmidt.